since my last review pub has taken a turn for the worst. 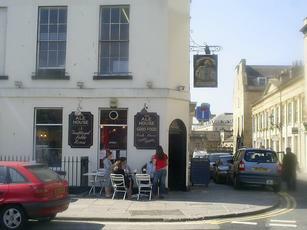 Gone very quiet again and stopped selling Holsten Pills one of very few pubs in Bath that sold it. Heard last night that the landlord is getting out only been there for just over a year said it wasnt paying.Oh well back to the drawing board. Starting to become a decent little boozer much cleaner now than two years ago and getting a decent crowd in on a Saturday night. Cellar bar seems to be getting more popular also. Good pub hope it gets even better. Excellent pint of Gem in here Sunday, actually finished of the barrel whilst there. then onto the london pride. Small quaint and traditional the one room I sat in and soon became full with a few regulars and foreigners alike. All drinking the real ale from what I could see. Small selection admited but, then again a small place..I liked it and, the barman seemed very efficeint indeed.